Frederic Gordon ONeill, born 1894, wrote Ernest Reuben Lilienthal and His Family published in 1949 by Stanford University Press. The history of the Catholic Church in California of chief interest to Americans is that of Alta California as distinguished from Lower California. The history of Christianity in our own California began with the founding of the first mission at San Diego on July 16, 1769. The founder of this mission, as of many others in this state, was Father Junipero Serra, a Majorcan and superior of the Franciscan Fathers. He and his Franciscan brethren were sent by the Spanish government not merely to serve as chaplains to the Spanish expeditionary forces, but also to preach Christianity to the natives. 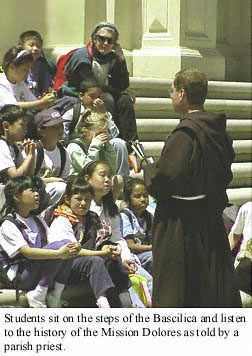 The problem before Father Serra was not merely the study of many distinctly different tribal languages and the teaching of the Gospel in those languages, but the necessity of training the most degraded of all American Indians to work consistently and form centers of population where the missioners could reach them. He therefore organized a series of centers in good agricultural lands, around which he gathered the reluctant and lazy savages. At these centers the buildings that are known to us as the missions were built. The original missions were not only churches, but also a group of buildings serving for workshops, granaries and dwellings. It is impossible in so short a space to go into the details of his work. He was one of the great apostolic men of the world, a fact which will be more appreciated as the glory of California is recognized throughout the world. In the short span of years before 1769 and 1798 this man was the prime mover in the founding of the following mission: San Diego, San Carlos, San Gabriel, San Antonio, San Luis Obispo, San Juan Capistrano, San Francisco, Santa Buenaventura, Santa Barbara, La Conception, La Soledad, Santa Cruz, San Juan Bautista, San Jose, San Miguel, San Fernando and San Luis Rey. In 1798 these missions claimed 15,562 converts to Christianity. By 1822 the following missions had been added: Santa Catarina and San Rafael, and the existing congregations numbered 20,958. From 1800 on until the end of the Mexican rule the missions suffered from the troubles of Spain, first in a war with France, breaking down Spanish discipline in Mexico, and then from the Mexican government after separation from Spain. Because the missioners had selected practically the sites of the future cities of California and had them made prosperous by educating the Indians to work, the properties became a great temptation to the revolutionary rules of Mexico, to whom California was then subject. The Franciscans owned nothing; the Indians owned the results of their labors. The technicality of the maneuvers which led to the breaking up of the missions only confuses the issue. The fact is that the missions were broken up in 1834 under a decree for secularization passed by the Mexican assembly in Mexico City. The Franciscans were persecuted, the Indians were dispersed and the officers of the Mexican government secured most of the plunder. In 1834, before the decree of secularization was enforced, there were 21 missions attended by 30,600 Indians. In 1842 the number of Indians left was 4450. In 1834 the Indians owned 424,000 head of horned cattle; in 1842 there were left 38,220. The driving of the Indians away from the missions was like the driving of orphans out of an orphan home would be. The mission period of California brought out the best and worst of Spanish character. The missions in the days of their building and peace were an idyllic Arcadia. The Mexican government by destroying the California missions destroyed the basic organization of the country. A period of squabbling followed among the plunderers. Mexican rule weakened, so that a small force of Americans were able to take over California. In 1840 Don Francisco Garcia Diego was appointed Bishop of California. He was a Franciscan. He died in 1846 and was able to accomplish little toward the rebuilding of the church. The Spanish days had passed. In 1846 and 1847 several hundreds of families entered California from the United States. In 1848 gold was discovered and by 1849 thousands had rushed to California. Many of these gold seekers were Catholic. Speaking English they had little contact with the few scattered Spanish priests. A few English-speaking priests from Oregon came to California. In 1850 a Dominican Father, the Very Rev. J.S. Alemany, provincial of his order of the State of Ohio, was consecrated Bishop in Rome and sent out as Bishop of California. He was a Spaniard by birth, but had been long enough in the United States to serve as a link between the old order and the new in California. Previous to his return, a shanty church had been built for immigrant Americans on the site of the present St. Francis church on Vallejo street. The North Beach was the center of American population; the old Mission Dolores was then out of reach. Bishop (later Archbishop) Alemany, with assistance of Rev. H.P. Gallagher, started to organize for American needs. The Sisters of Notre Dame had already been established in San Jose. He brought in 1852 the Sisters of Charity. They were needed because of the great number of children orphaned by the cholera epidemic of 1850 in San Francisco. On his arrival in California Bishop Alemany made his residence at Monterey, but the growth of population required the division of California for effective spiritual administration. As archbishop of San Francisco, the Most Reverend Alemany moved to this city in 1853. The country south of Santa Cruz was placed under the diocese of Los Angeles and Monterey, of which the Right Reverend Dr. Amat was named bishop in 1854. The Sisters of the Presentation were brought to San Francisco in 1854 and immediately started at this time their work of education. The Sisters of Mercy soon followed. 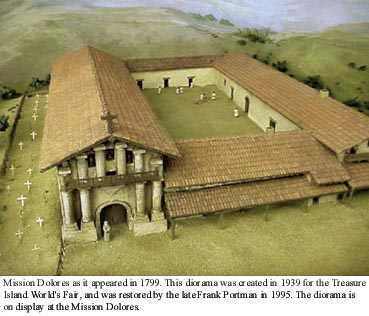 A seminary for the education of secular priests was started at this time near the Mission Dolores under the title of St. Thomas. St. Marys Hospital was founded in 1856. The division of the archdiocese into parishes proceeded with the growth of the city. The results are apparent. In 1850 Dr. Alemany found himself at the head of 15 priests; in 1871 he was assisted by 170. He had by 1871 7 orphanages, 4 hospitals, 5 colleges, 13 convents and academies, 165 parish churches and 60,000 Catholic people. The diocese of Los Angeles and Monterey had grown to a population of 30,000 by 1870 and was sufficiently organized for its need up to that time. In 1883, his Grace, Patrick William Riordan, a native of New Brunswick and later a priest of the Chicago archdiocese, was appointed coadjutor bishop with the right of succession to the See of San Francisco. In December, 1884, Archbishop Alemany resigned the See and retired to a monastery of the Dominican Order. Archbishop Riordan started his work by subdividing and creating new parishes that priests and people might have closer contact. Under him many new churches were erected, the great St. Patricks Seminary at Menlo Park, and the [St. Marys] Cathedral on Van Ness avenue, and numerous parish schools, several hospitals and charitable institutions. His administration effect not only the building of new churches and institutions, but also the replacement of wooden structures with brick and stone. In 1906 the loss to the San Francisco archdiocese by fire amounted to $2,000,000. The buildings damaged were rebuilt and paid for. Archbishop Riordan died December 27, 1914. The Most Rev. Edward J. Hanna was appointed to the See of San Francisco June 1, 1915.
Notable among the achievements of Archbishop Hanna is the new junior seminary, St. Josephs College, at Los Altos. It is a marvelous building from the standpoint of situation and beauty. There are now 43 churches in the city of San Francisco, 17 in Oakland, 161 outside these two cities in the archdiocese. There are 48 parochial schools, 34 schools of high-school rank, and seven colleges, beside the most charitable organizations well known to the public. The buildings mentioned indicate the spiritual and temporal progress of the Catholic church. The bishop of Los Angeles is the Right Reverend John J. Cantwell, D.D. The progress made in his diocese is shown by the 320 church parishes, a Catholic population of 285,000, and 68 parochial schools. Due to the growth of the Catholic church in California, the diocese of Sacramento was erected in 1886. The bishop at Sacramento is the Right Reverend Patrick J. Keane, D.D. In his diocese there are 242 Catholic churches and a Catholic population of 56, 000. In 1922 the diocese of Monterey-Fresno was instituted and the Right Reverend John B. McGinley, D.D., is its bishop. There are 70 parishes in his diocese and a Catholic population of 50,000. The future growth of the Catholic church in California will, it is anticipated, be more rapid during the next 75 years than during the last. The most difficult pioneer work is past. September 1925 Return to the top of the page.